KCNANorth Korean leader Kim Jong Un greets a member of the South Korean at a dinner between the two countries this week. Donald Trump and Kim Jong Un plan to meet sometime over the next few weeks. Kim suggested the meeting to South Korean officials at a summit in Pyongyang earlier this week. During the meeting, he reportedly appeared “relaxed” about his international reputation and even made fun of himself. He also enjoyed noodles and wine with South Korean officials. Donald Trump and Kim Jong Un have agreed to meet for the first time, in what’s been hailed as both a diplomatic coup and “propaganda bonanza” for the North Korean leader. The meeting comes after months of squabbling and name-calling by the two leaders. Trump has repeatedly called Kim Jong Un “Little Rocket Man,” and Kim called Trump a “mentally deranged US dotard” in response. 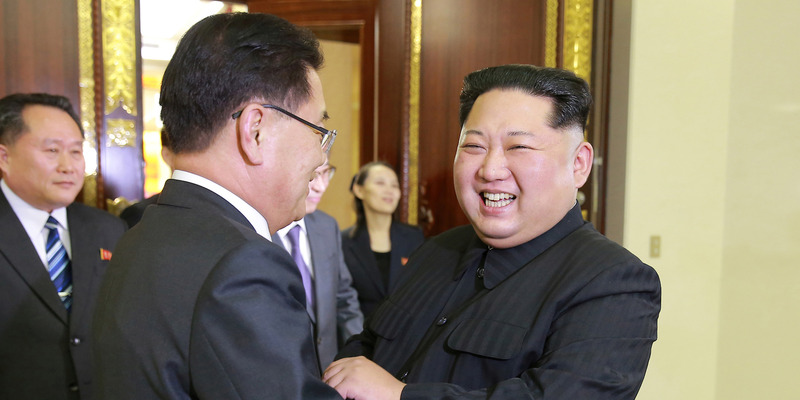 But accounts from inside this week’s historic talks between Kim and South Korean officials suggest that the North Korean dictator can see the funny side of the slanging match. Kim was “very aware” of his international reputation, and even laughed about himself in front of the South Korean delegation, according to accounts relayed to Reuters. “The North Korean leader, repeatedly derided as ‘Little Rocket Man’ by Trump, was ‘very aware’ of his image, the official said, and reacted to comments made about him in a ‘relaxed’ manner by joking about himself from time to time,” Reuters said. At the same two-day summit, Kim promised to give up his nuclear weapons and said he wanted to meet Trump, which spurred South Korean officials to invite Trump to a meeting in North Korea. 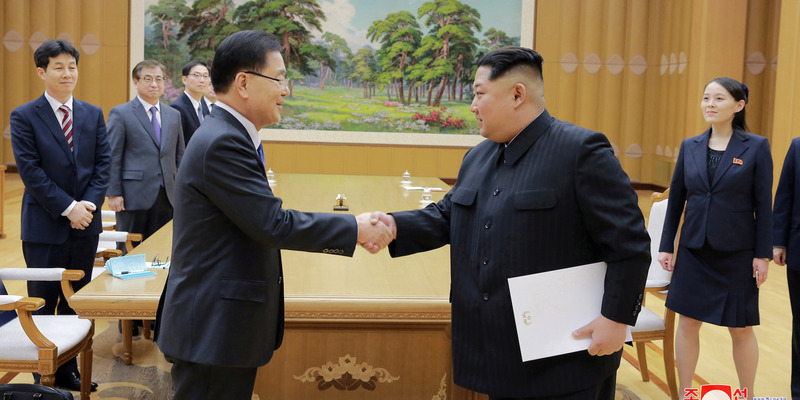 KCNANorth Korean leader Kim Jong Un shakes hands with Chung Eui Yong, the leader of the South Korean delegation, earlier this week. Kim’s sister, Kim Yo Jong, is standing behind him. Kim and the South Korean delegates also drank copiously at the summit, which took place on Monday and Tuesday, the officials said. They reportedly shared several bottles of wine, liquor made of ginseng, and local soju from Pyongyang. “The bottles kept coming,” said another South Korean source who was officially briefed on the meeting. The South Korean delegation was served hot pot and cold noodles, a regional specialty, at the summit, the government official told Reuters. The officials from Seoul were also hosted at the Kobangsan Guest House, a “luxury resort” overlooking Pyongyang’s Taedong River,NK News reported. Kim’s wife, Ri Sol Ju, also met the South Korean delegation for dinner on Monday night. The anecdote contrasts with that of Korean security expert Nam Sung Wook, who said a 15-year-old Kim “exploded with foul language” when his high school girlfriend asked him to quit smoking.